Achieve effortless grooming with the Hawkins & Brimble 6 Piece Gift Set, a comprehensive beard and haircare kit that ensures smooth, sophisticated styling. The set of six products covers everything you’ll need to achieve the ideal shave and the perfect finish. Creating a rich lather upon contact with skin, this lightweight shaving cream allows your razor to glide effortlessly over the face with less resistance, fewer nicks and minimised irritation. Delivers an invigorating Elemi and Ginseng fragrance, whilst softening skin and facial hair for a clean, smooth shaving experience. Delivering long-lasting hold, this hair wax allows you to create your desired look with ease. Harnessing the powers of Cocoa Butter and Beeswax, the lightweight, non-greasy styling wax nourishes and conditions hair, whilst Jojoba and Almond Oils add shine and lock in moisture. Use on dry or damp hair for a salon-worthy finish without messy build-up, flaking or stiffness. Achieve a close, comfortable shave every time with this shaving brush. With an ergonomic handle and super-soft boar bristles, the durable brush enhances the lather of your shaving cream to help you achieve a high-performance shave. The perfect addition to your grooming regime. Treat your facial fuzz to a lightweight, deeply conditioning formula that works to soften and hydrate without greasy residue. Harnessing the powers of Shea Butter and Argan Oil, rich in fatty acids and antioxidant Vitamin E, the fast-absorbing oil combats frizz and dryness, whilst nourishing the skin beneath your beard for long-lasting comfort. Expect a smooth, tame beard with a dapper finish and the brand's signature Elemi and Ginseng fragrance. A scrub that softens and prepares skin for a close, comfortable shave. Fortified with Walnut Shell, the formula gently buffs away roughness, dryness and dead skin cells, whilst Sweet Almond Oil lifts and conditions hair to leave you ready for a clean, smooth shaving experience. Subtly fragranced with the brand's signature Elemi and Ginseng scent. This gentle balm soothes and calms just-shaven skin for long-lasting comfort. Harnessing the powers of Cocoa Butter, Almond Oil and antioxidant Vitamin E, the lightweight, non-greasy aftershave balm helps to relieve redness and irritation, whilst delivering long-lasting moisture and hydration for a soft, smooth complexion. Subtly fragranced with the brand's signature Elemi and Ginseng scent. No Parabens, SLS or Colourants. Not tested on animals. Cream: Apply cream to brush, massage into your stubble using circular brush strokes for a smooth close shave. Wax: Work a small amount into palms and apply evenly to damp or dry hair for shine and hold. Brush: For a rich lather, hold the brush beneath running hot water, ensuring as much water is held on the brush as possible to hydrate and protect your skin during shaving. 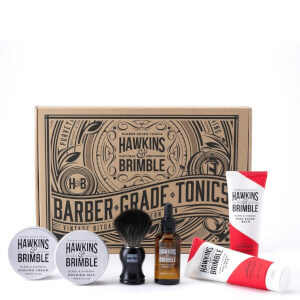 Using a circular motion, apply a small amount of Hawkins & Brimble Shaving Cream to the brush. Use a small amount of pressure to lather up your face working from the neck upwards. When shaving is complete, rinse the brush under running water until the brush is soap free, then shake vigorously to remove all the water. Oil: Drop the desired amount of oil into palm. Apply evenly to facial hair and skin. Scrub: To prepare your skin gently massage product on wet skin and rinse for silky smooth, close and comfortable shaving. immediately. Balm: Apply to face and gently massage after shaving. Cream: Aqua, Propylene Glycol, Sodium Stearate, Sodium Cocoate, Glycerin, Dimethicone, Phenoxyethanol, Ceteareth-20, Peg 75 Lanolin, Sodium Chloride, Parfum, Pentasodium Pentetate, Tetrasodium Etidronate, Linalool. Wax: Ricinus Communis (Castor) Seed Oil, Prunus Dulcis (Almond) Oil, Cera Alba (Beeswax), Simmondsia Chinensis (Jojoba) Seed Oil, Copernicia Prunifera (Carnauba) Wax, Theobroma Cacao (Cocoa) Seed Butter, Parfum (Fragrance), Tocopheryl Acetate (Vitamin E), Linalool, Limonene, Butylphenyl Methylpropional, Benzyl Salicylate, Coumarin. Oil: Prunus Dulcis (Almond) Oil, Butyrospermum Parkii (Shea Butter), Ricinus Communis (Castor) Seed Oil, Parfum (Fragrance), Olea Europaea (Olive) Oil, Argania Spinosa Kernel (Argan) Oil, Tocopheryl Acetate (Vitamin E), Dimethicone, Linalool, Limonene, Butylphenyl Methylpropional, Benzyl Salicylate, Coumarin. Scrub: Aqua (Water), Juglans Regia (Walnut) Shell Powder, cetearyl Alcohol, Peg-20 Stearate, Prunis Amygdalus Dulcis (Sweet Almond) Oil, Glycerylstearate, Glycerin, Ceteareth-20, Phenoxyethanol, Parfum (Fragrance), Ethylhexylglycerin, Linalool. Balm: Aqua (Water), Cetearyl Alcohol, Prunus Dulcis (Almond) Oil, Peg-20 Stearate, Glyceryl Stearate, Tapioca Starch, Glycerin, Phenoxyethanol, Theobroma Cacao (Cocoa) Seed Butter, Olea Europaea (Olive) Fruit Oil, Panthenol (Vitamin B5), Tocopheryl Acetate (Vitamin E), Ethylhexylglycerin, Linalool, Limonene, Butylphenyl Methylpropional.